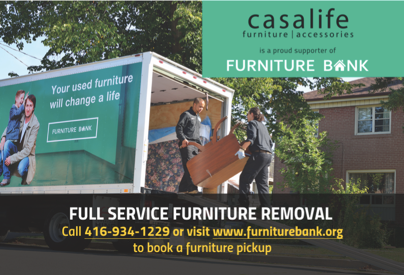 casalife is proud to support Furniture Bank whose mandate it is to facilitate gently-used furniture being donated for a removal fee by people who no longer use it, and provided free-of-charge to those who are struggling financially to furnish their homes. A network of community agencies ensures the right people get access to the furniture. It's a cycle of giving and helping, providing the most vulnerable individuals in society the means to create a home. Learn more about Furniture Bank.